The Socialist Fraternal Kiss, “The Kiss”, 1979. 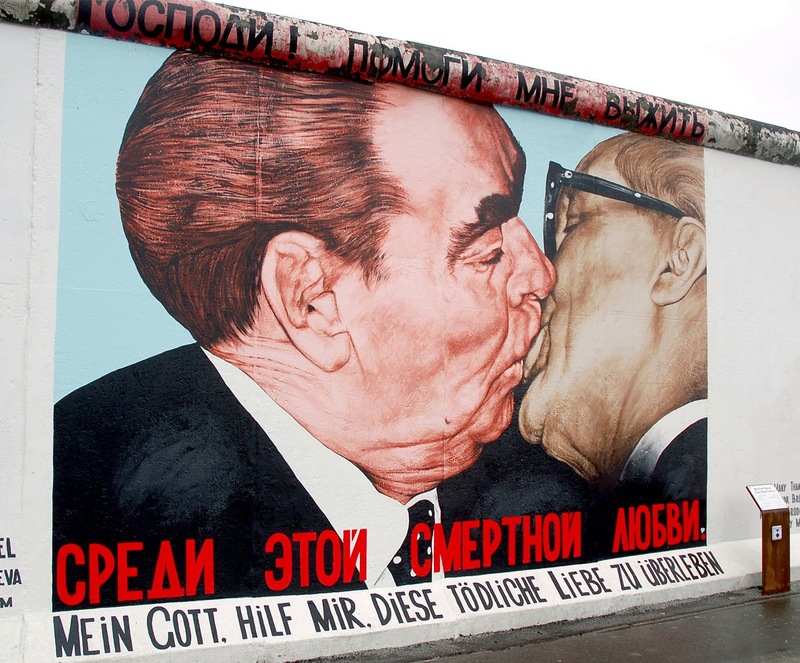 The socialist fraternal kiss became famous via Erich Honecker and Leonid Brezhnev, who were photographed exercising the ritual. 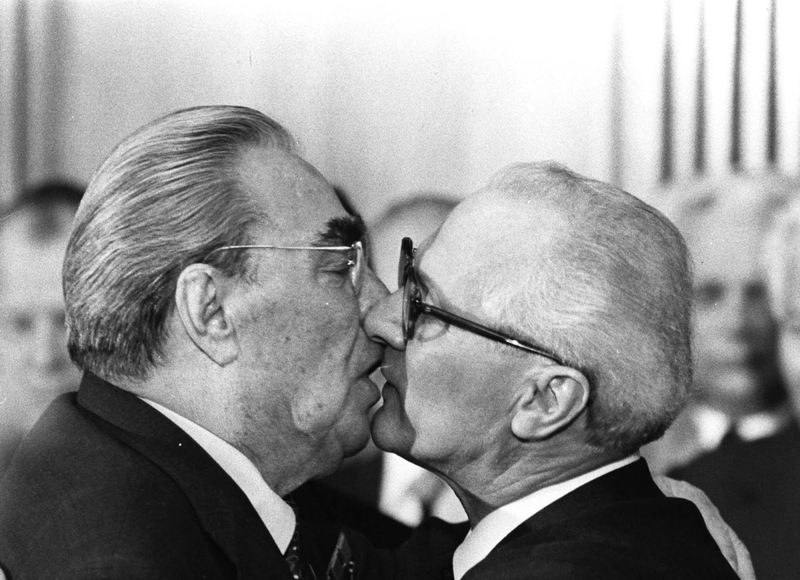 During the festivities of the 30th anniversary of the German Democratic Republic of East Germany in 1979, photographer Regis Bossu was able to take a photograph of the decisive moment wherein Leonid Brezhnev and President Erich Honecker were practicing a socialist fraternal kiss. After the photograph was taken, a lot of magazines used it immediately with one magazine captioning it as “The Kiss”. “The Fraternal Kiss” is an example of how a single image can go beyond pure representation and elevate the documentary photography to another level. Depicting the emblematic act for the communists, Bossu’s photograph epitomizes the whole communist world. It symbolizes a mighty site of the Cold War: the Eastern Bloc, thus in a way the Cold War itself. Soviet President Leonid Brezhnev and East German leader Erich Honecker change kisses after Brezhnev was honored with the title “Hero of the German Democratic Republic” and the “Karl Marx Medal”. The socialist fraternal kiss consists of an embrace and a mutual kiss to cheeks or in rarer cases to the mouth. The origin of this ritual stems from the Eastern Orthodox Fraternal- or Easter Kiss, which through its entrenchment in the rites of the Orthodox Church carried a substantial strength of expression and so found use in daily life. Communist political leaders frequently kissed as a matter of formality in those days. 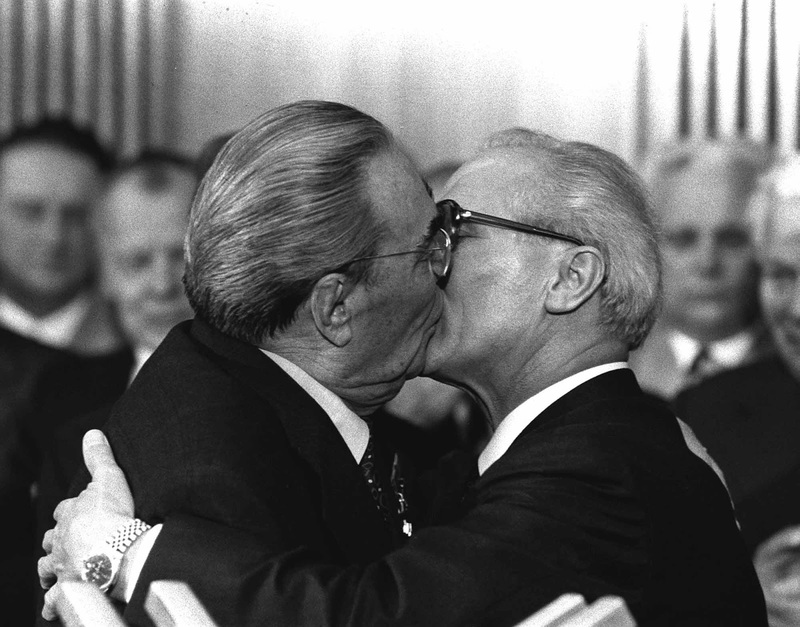 So when East German President Erich Honecker went to embrace the Soviet leader, the kiss wasn’t exactly shocking—except for the enthusiasm both men showed for the lip lock. The photograph of the Kiss spread around the world, with the Paris Match magazine featuring it in a dramatic two-page spread. And when the Berlin Wall came down in 1989, the Soviet artist Dmitri Vrubel decided to paint the iconic image on the east side of the Berlin Wall, along with paintings from other artists who descended upon the city in the heady days following the fall of the Wall. The caption that runs beneath Vrubel’s painting says: “My God, Help Me to Survive This Deadly Love”. “My God, help me to survive this deadly Love”. Some Kremlinologists studying the USSR paid close attention to whether the fraternal embrace was exchanged between Communist leaders. The omission of the customary embrace is taken to indicate a lower level of relations between the two countries. For example, after the Sino-Soviet split, the Chinese refused to embrace their Soviet counterparts or to address them as “comrade”. Even with the normalization of relations in 1989, the Chinese continued to omit the fraternal embrace when greeting Soviet leaders, even as they exchanged the fraternal embrace with leaders from other Communist countries. This was done to emphasize that Sino-Soviet relations were not returning to the level that they were in the 1950s, prior to the split; Chinese protocol specifically insisted on “handshake, no embrace”. Leonid Brezhnev applied often the Socialist Fraternal Kiss, so one time Brezhnev was commenting about a foreign leader: “As a politician, rubbish… but what a good kisser! It’s a joke!”. In March 2009, the graffiti painting, along with others, was erased from the wall to allow the original artists to repaint them with more durable paints. Vrubel was commissioned to repaint the piece. Photographer Bossu and Vrubel met in 2009 and were photographed together on 16 June with reproductions of their works. (Photo credit: AP Photo / Helmuth Lohmann / Corbis). Great Comrade Brezhnev is truly great! One cannot deny his greatness! He is the definition of all that is great and wonderful! Thank GOD the sucker didn't last long in power. I remember when I was kid watching FIFA WORLD CUP, and the players from Russia practiced the death kiss, or braezhnev's kiss, every time they scored against the others teams. So.... what is the problem?